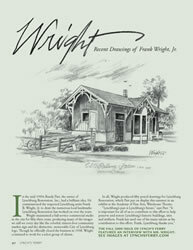 Lynch's Ferry Magazine | A Journal of Lynchburg History - Recent Drawings by Frank B. Wright, Jr.
You are here: Archives » Fall 2006 » Recent Drawings by Frank B. Wright, Jr.
Current page is 1.2.6: Recent Drawings by Frank B. Wright, Jr. Recent Drawings by Frank B. Wright, Jr. In the mid-1990s Randy Parr, the owner of Lynchburg Restoration, Inc., had a brilliant idea. He commissioned the respected Lynchburg artist Frank B. Wright, Jr. to draw the numerous local landmarks Lynchburg Restoration has worked on over the years. Wright maintained a full-service commercial studio in the city for fifty-three years, producing many of the images we still see every day like the colorful, sixteen-foot community market sign and the distinctive, memorable City of Lynchburg logo. Though he officially closed the business in 1998, Wright continued to work for a select group of clients. In all, Wright produced fifty pencil drawings for Lynchburg Restoration, which Parr put on display this summer in an exhibit at the Academy of Fine Arts, Warehouse Theatre.